Mike Yardy was a cricketer who made the very best of his abilities and someone whom I was very glad to see do well. I suspect that his book, Hard Yards, could do very well. Okay, he is the second high-profile cricketer to be diagnosed with a mental illness which has more recently come into the public conscience. Naturally, a good deal of the book’s focus is about his unfortunate time dealing with it but the writing and his examples should help give an understanding of the symptoms. As he mentions, there may be people out there who may still pooh-pooh at others but there will doubtless be many others who will have either great sympathy or empathy for his condition. Mike now works on behalf of Mind, the mental health charity and, with luck, his book will spread awareness of the suffering caused. His wife, Karin, also write a moving and interesting chapter to end her husband’s autobiography. Mike Yardy was also a thoroughly decent cricketer and person. Possibly remembered for the dramatic change to his batting style, he mentions this often. Graham Gooch was another player who somewhat altered his batting stance and both profited from it so fair play to both for possibly eschewing stance for substance. A Sussex man through and through, Mike was a lynchpin of a very successful Sussex side in the early 2000s and its captain towards the latter part of his career. Hard Yards comes over very well. As an international cricketer who really made his name in the T20 format, his comments on this shortest format of the game are illuminating. Lest we forget, Mike Yardy was part of an England side which has, to date, won its only ICC tournament so is only one of eleven such players. I found many interesting topics within this book. Candidly written, Mike mentions his benefit. Of course, this is a potentially great source of income to many cricketers but he speaks about the initial demons of public speaking and how he became better at it as the particular season went on. It is interesting also to read of his experiences of playing for England and the differences involved between representing country and county. There are, as may be expected because of his condition, some passages which may surprise but Mike never comes across without hope. 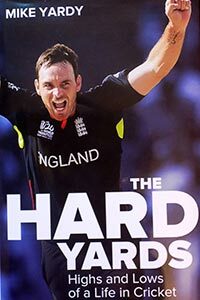 I would not be surprised if Mike Yardy’s Hard Yards becomes, like Marcus Trescothick’s autobiography, an important cricket book and there will be many, like me, I am sure, who wish Mike Yardy a very successful future and look back fondly on his cricketing career.